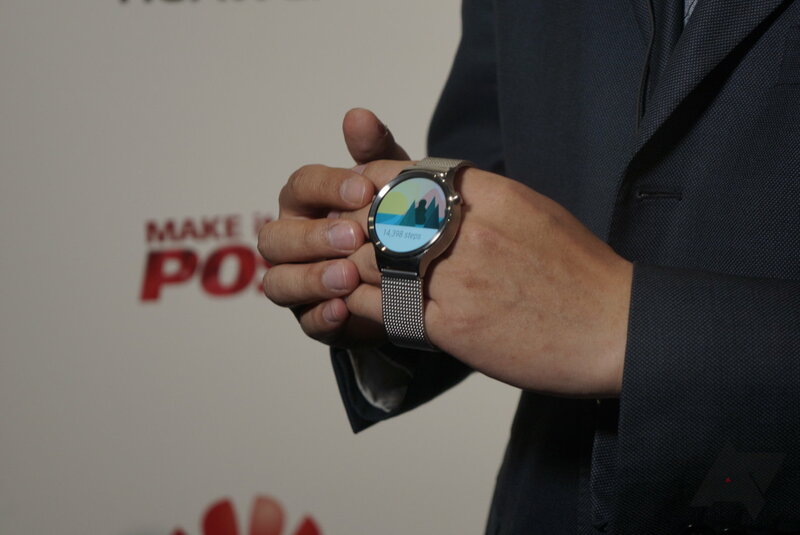 We have added photos from the MWC announcement. We have updated the specs with more information. If you measure the success of a product release by the element of surprise, Huawei might not score too well. 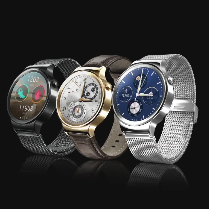 We found official product videos for the new Huawei Watch yesterday, ahead of today's announcement. 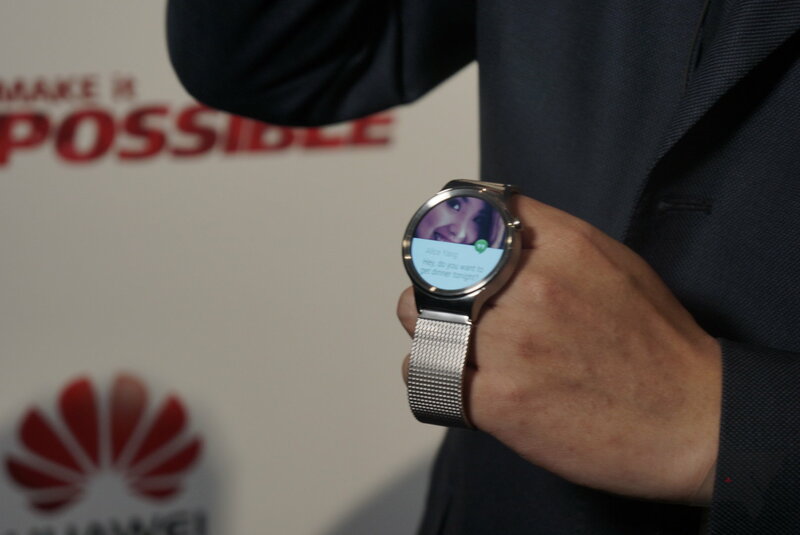 Huawei's TalkBand devices showed up in ads days ago and in their own wearables app yesterday. 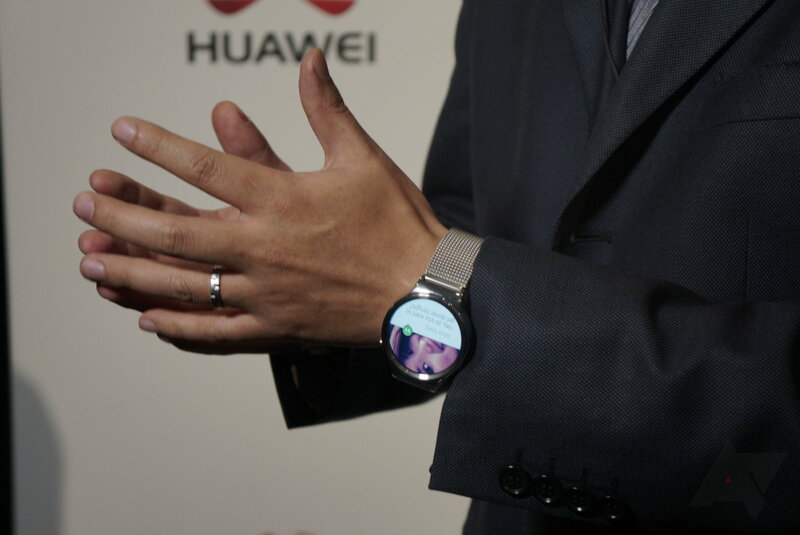 If you measure its success by how much attention and anticipation it generates, you might say that Huawei's new wearables have had a smashingly successful release, especially considering their absence from many Western markets until now. 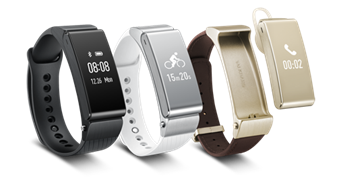 At last, we have gotten official word on the release of three wearables: Watch, TalkBand B2, and TalkBand N1. We'll take them one-by-one. While Huawei gets props for making a truly interesting device, this name...well, it's so bland that it borders on the absurd. I would suggest HuaWatch. Anyway, the hardware can really speak for itself. 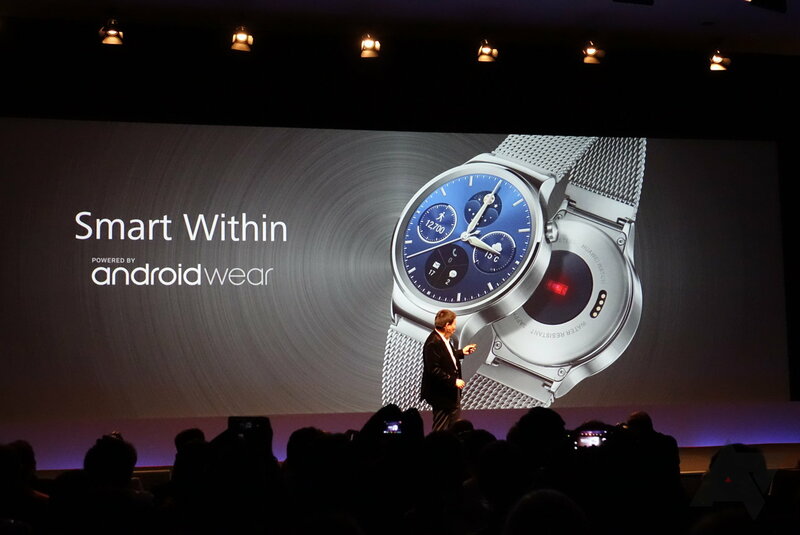 As you might expect, this handsome watch will be running Android Wear, bringing with it all the Google goodness. Not bad for the first try! We'll have to get a closer look in person before making too firm of a declaration, but this could be the best-looking Android wearable yet. It has the styling of something you can wear to the least tech-friendly workplace without looking like an oddball. 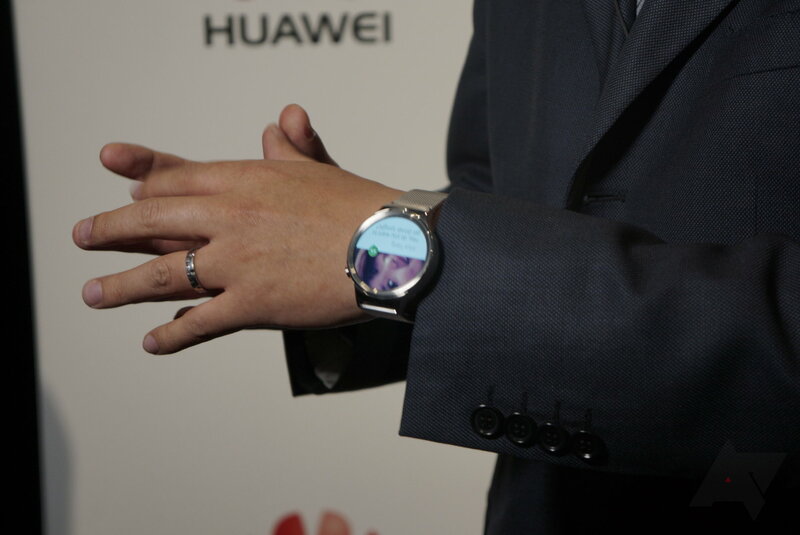 As we've seen with most Android Wear watches thus far, Huawei's rendition will try to deliver useful health tracking. A heart-rate monitor, 6-axis motion sensor, and barometer team together to determine whether the wearer is walking, running, biking, etc. This will produce calorie burn estimates that might well make it one of the better devices in this arena. 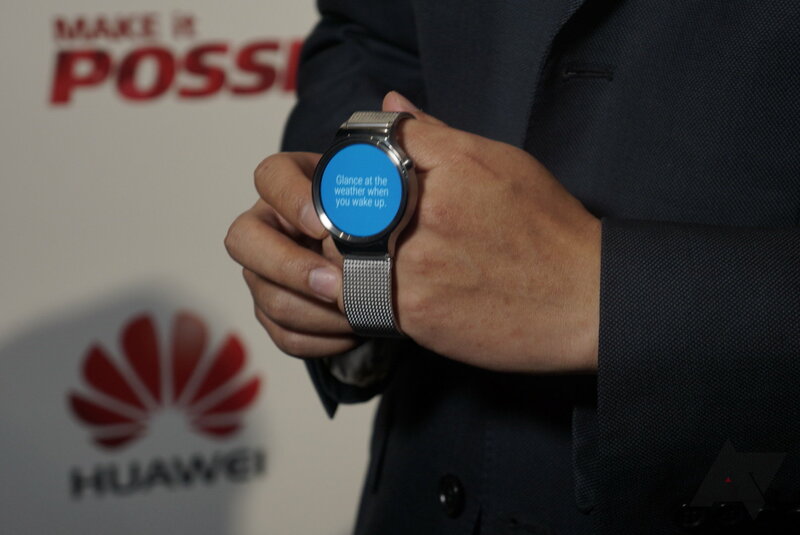 While details are sparse, Huawei claims to have a partnership with Jawbone to make things work on the software side. 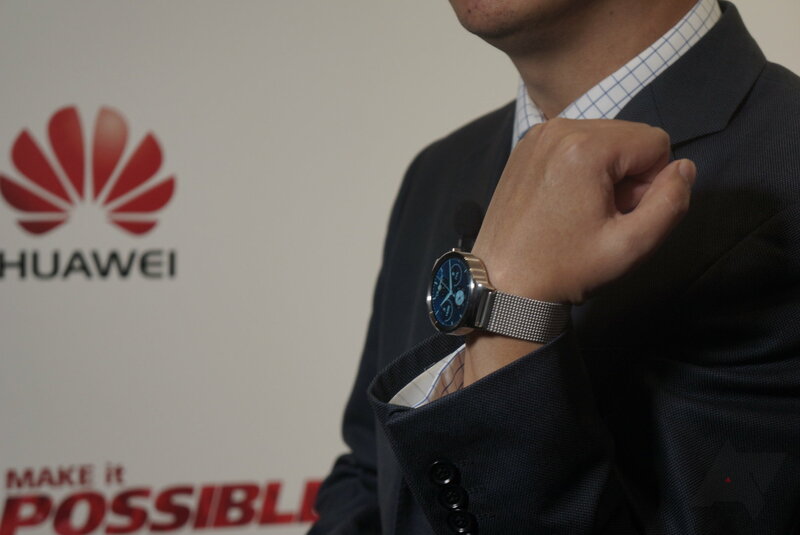 And yes, Huawei Watch will be available in the United States and at least 19 other countries at launch. The physical crown button, located at the "2 o'clock" position, will be a distinguishing feature if it is properly integrated into the software. Notably missing from the stated specs is the exact processor being used and any comment on battery life. Early adopters know these two aspects can easily make or break the success of the watch. Charging will occur via a magnetic connector. The timepiece itself can be purchased in either gold, silver, or black. Many more options are available for wrist straps, which appear to be interchangeable by the owner. 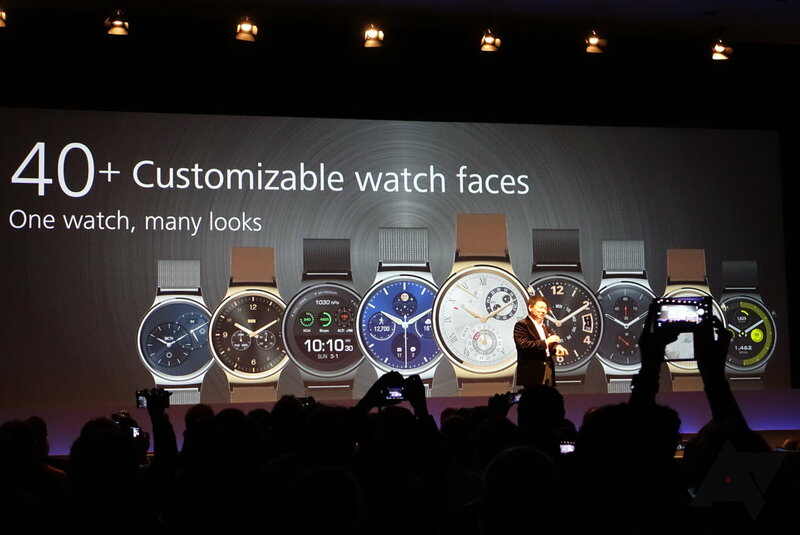 Huawei says the Watch was designed "with personalization in mind." See below for photos taken by Android Police in Barcelona. The B2, a second-generation device, is a unique entry into the health-oriented wearable space. The hardware includes both a wristband and a Bluetooth headset. 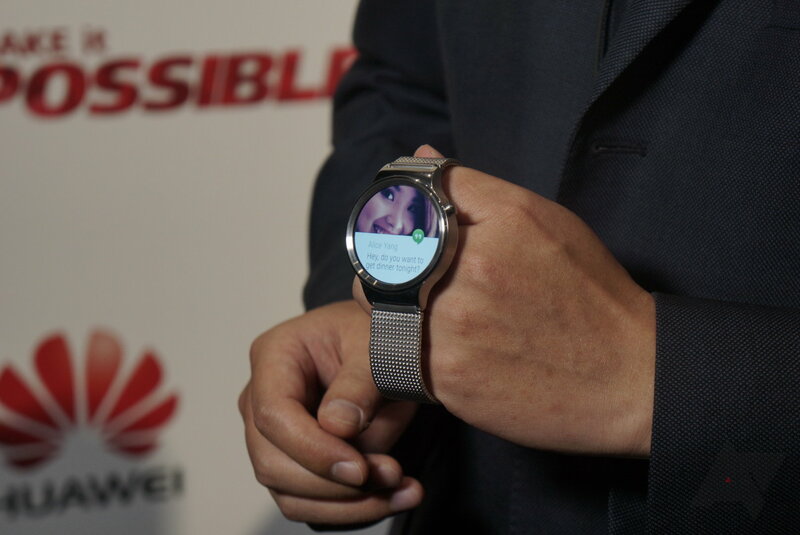 Unlike the Huawei Watch, the TalkBand B2 is platform agnostic, boasting compatibility with Android 4.0+ and iOS 7+. Huawei claims they are targeting "on-the-run business executives who are athletically active." That may or may not be you, but many people might like to think they are this kind of person. You are seeing the image correctly, by the way, the headset fits into the band. When disconnected (and presumably in your ear), phone calls and the like will be pushed to the earpiece. Otherwise, you will get alerts somewhat similarly to a Pebble. 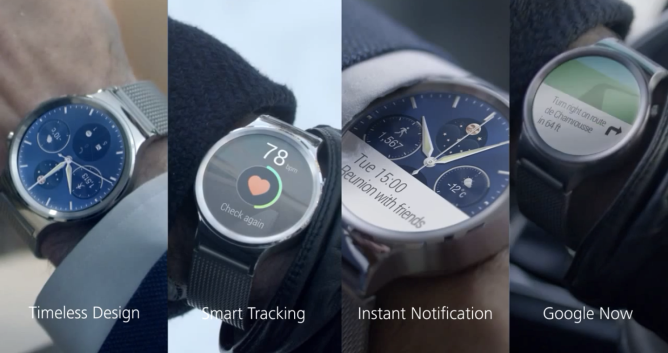 Like the more fully-featured Huawei Watch, the B2 has sensors to aid in tracking your physical activity. Paired with a proprietary app, you can read out this data on your phone and also use the B2 to locate your Android or Apple device. US availability is unknown, and the retail price will be 169 EUR ($189 USD) for the leather band and 199 EUR ($223 USD) for the TPU band. 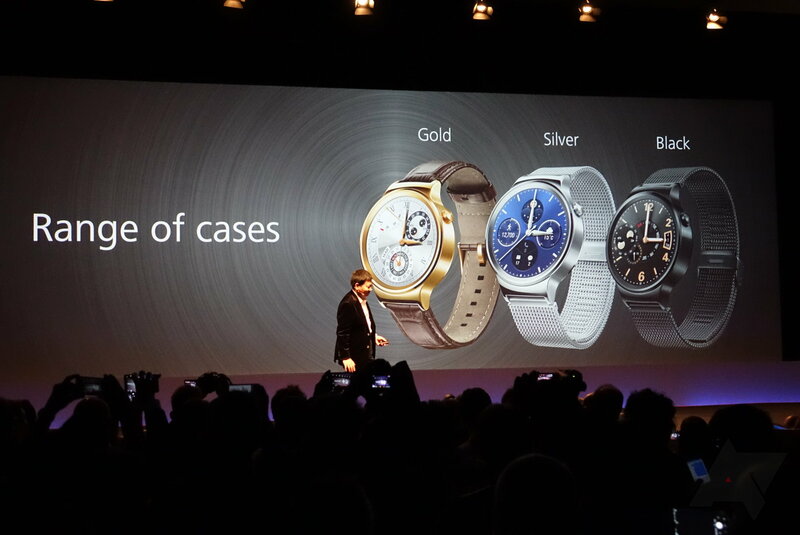 You can think of the N1 as another step away from smartwatch compared to the B2. In this case, it's so far from a watch that there is no watch component. It is simply a Bluetooth headset. Still, it claims health tracking ability, though the exact hardware used to do so is not so clear. Sound quality is a priority in this device, supporting aptX codecs and having buds for both ears. Like the B2, US availability has not been discussed. The three color options — silver, grey, and red — will cost 119 EUR ($133 USD) each. Also, that red does not look very red to my eye. 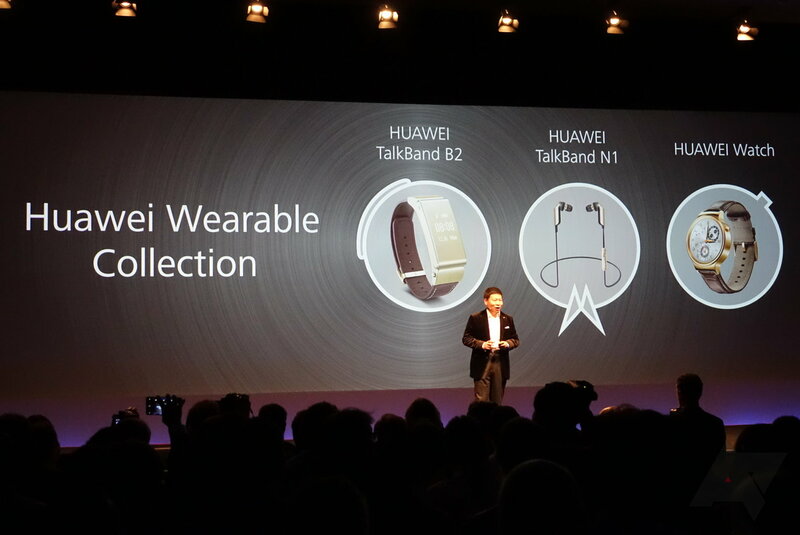 And similar to the B2, you will interact with the TalkBand N1 via Huawei's Android app. The two buds are magnetic and can therefore lightly attach to one another. Or, as Huawei says, they can turn into "a fashionable necklace accessory!" I'll let you decide how fashionable the N1 necklace will be. 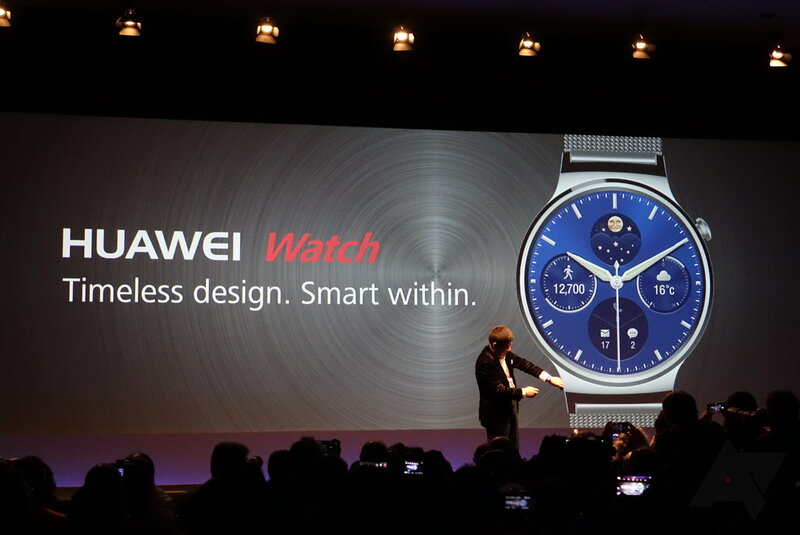 Barcelona, Spain, March 1, 2015: Huawei continues to break new ground in the wearables space by unveiling today the Huawei Watch, powered by Android Wear™ at Mobile World Congress (MWC) 2015. The fully circular watch features a 1.4-inch touch-sensitive AMOLED display, scratch-proof sapphire crystal lens, cold-forged stainless steel frame, and comes with a built-in heart rate monitor and 6-Axis motion sensors. 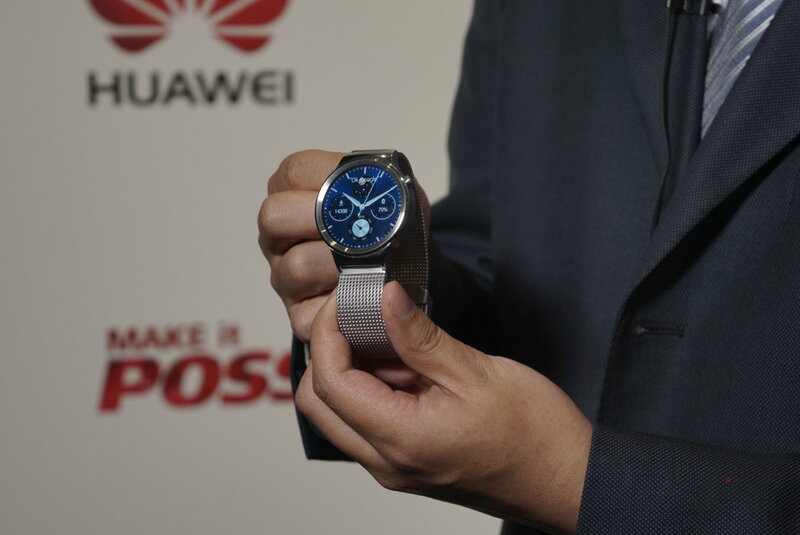 The Huawei Watch is the first smartwatch in the Huawei wearable family. 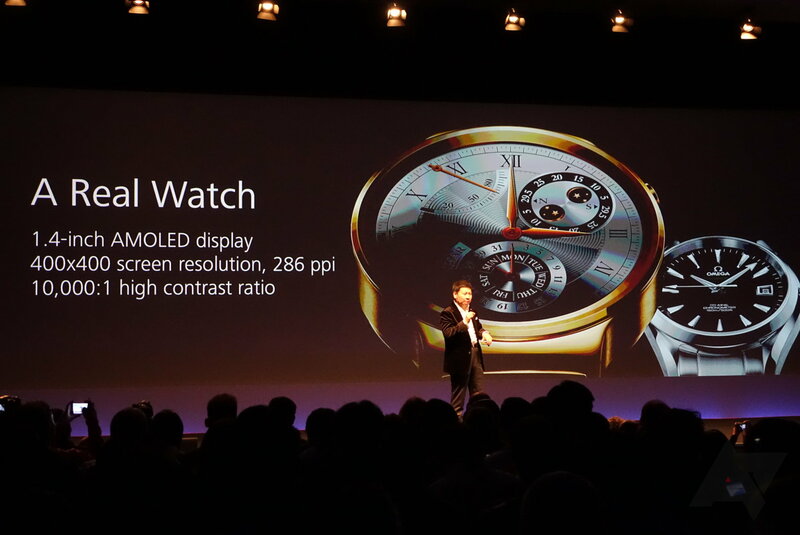 Designed by a team of experienced watch designers that have a rich history in creating fashionable and timeless watches, the attention-to-detail becomes apparent upon first glance as the device boasts a sparkling AMOLED 1.4-inch display at 400 x 400 pixels resolution in 286 ppi at a 10,000:1 high contrast ratio, making it the most vibrant Android Wear smartwatch in the world. 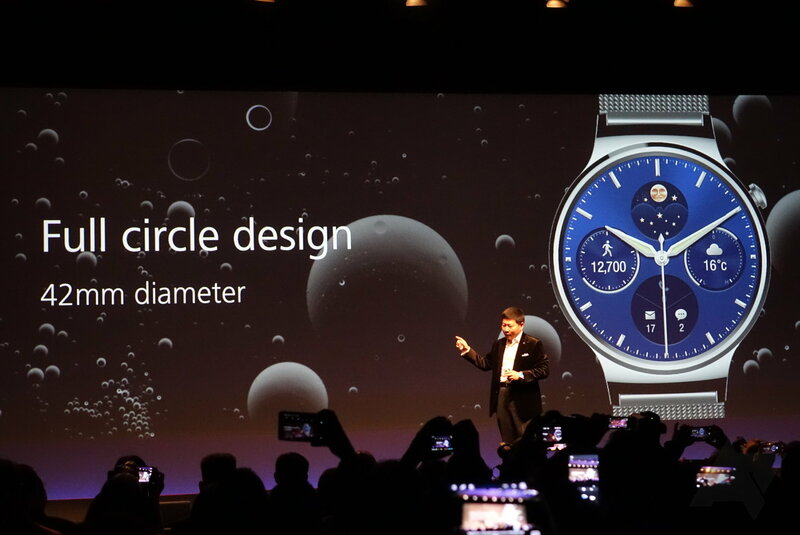 Made of more than 130 components, Huawei Watch has a crown, frame and hinge built from high-quality and scratch resistant cold-forged stainless steel making it 40 percent harder. With an intuitive 2 o’clock press button, the watch offers the highest levels of control and comfort to the user. 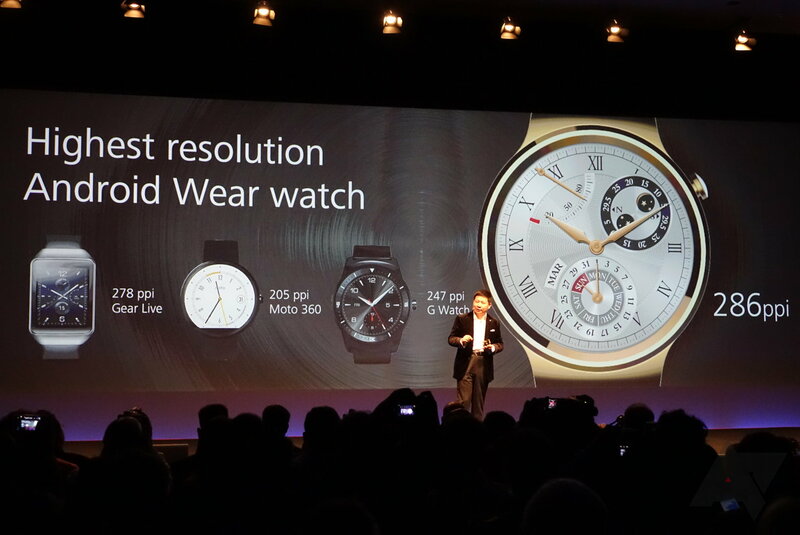 The Huawei Watch comes in three stylish colors: gold, silver and black. 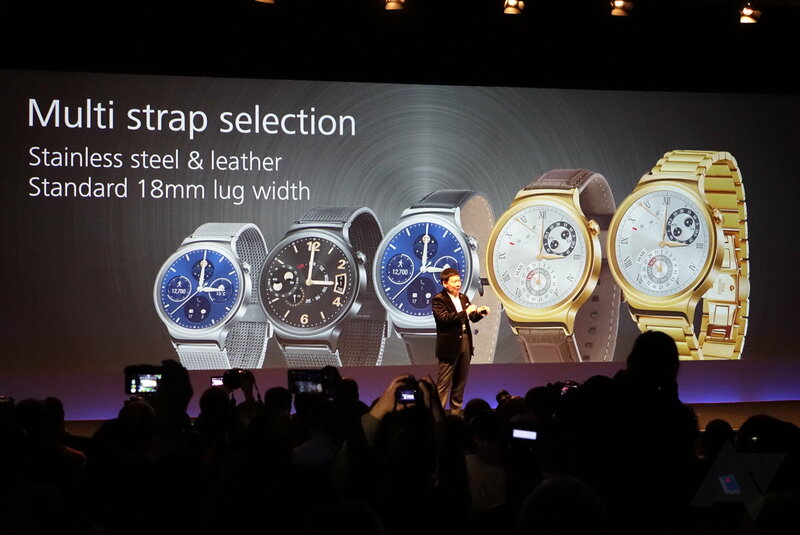 Designed with personalization in mind, more than 40 unique watch faces will be available to choose from, including a full range of watch straps made from different materials, and styles. 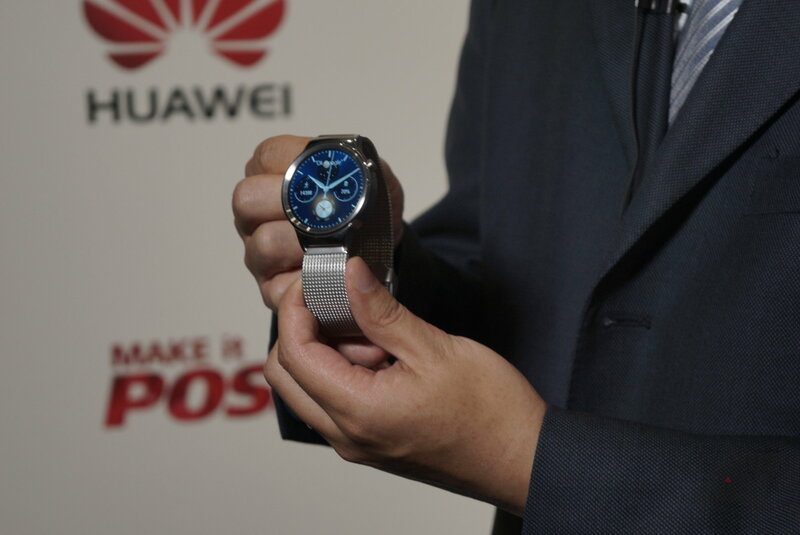 The Huawei Watch will come with a magnetic charging station for the users benefit. Powered by Android Wear, receiving SMS, email, calendar, app, and phone call notifications has never been easier or more convenient. Compatible with smartphones running Android 4.3 or higher, Huawei Watch boasts a powerful Qualcomm 1.2GHz processor for optimal performance, includes 4GB of storage, 512MB of RAM and Bluetooth 4.1. For the sports enthusiast, or just those interested in tracking fitness levels, Huawei Watch features a heart rate monitor sensor, 6-Axis motion sensor, and barometer sensor that automatically detects and tracks in real-time if a user is walking, running, biking, hiking or sleeping. Specifically, users can monitor everything from the number of calories burned, to heart rate, climbing height, steps taken, and distance travelled. To encourage consumers to live happier and healthier lives, Huawei is dedicated to building a wearable’s health and lifestyle ecosystem that will help users set goals and track their progress. With exciting partners including Jawbone, the Huawei Health Ecosystem seeks other innovative third-party health and fitness apps that will encourage users to set themselves free. Huawei Watch will be available in more than 20 countries including United States, United Kingdom, Argentina, Australia, Brazil, Canada, Denmark, Finland, France, Germany, Hong Kong, Italy, Japan, Norway, Philippines, Russia, Singapore, South Korea, Spain, Sweden, Switzerland, United Arab Emirates. Exact availability and pricing will be announced at a future date in each of the local markets. The second generation of Huawei’s TalkBand products, Huawei TalkBand B2 showcases a more business-like professional design, has smarter fitness tracking functionality with higher accuracy, and enhanced synchronization with the users mobile device. Inheriting a more superior Bluetooth connectivity than its predecessor, Huawei TalkBand B2 is not only a convenient health management device, but also the perfect combination of Bluetooth headset and sports bracelet, ideal for the on-the-run business executives who are athletically active. Equipped with an advanced 6-axis sensor, TalkBand B2’s smart detection can automatically identify and record motions accurately, detect the duration of deep sleep and light sleep, and provide consumers with health tips on ways to improve their sleep pattern. The perfect companion to consumers’ mobile devices, TalkBand B2 is equipped with dual-microphone, noise reduction technology and quality Bluetooth connectivity. Additionally, it is also equipped with smart detection to understand whether the Bluetooth earpiece is on the wristband or not, allowing it to automatically push audio (music/call) to the smartphone or B2 bracelet. TalkBand B2 is also equipped with a pager to search and locate your smartphone, regardless of the phone model, through vibration or ring tone alerts. Designed with fashion in mind by the Huawei Aesthetics Center team in Paris, the minimalistic design of Huawei TalkBand B2 embraces simplicity. The metal bracket of TalkBand B2 is made of high strength, light weight aviation aluminum. With an intuitive and user-friendly HD touch screen, TalkBand B2 comes in two watchband styles, the environmentally professional TPU material or the luxurious leather, which caters to different occasions. Each style comes in many different color varieties. TalkBand B2 has superb battery performance allowing it to operate up to five days, support continuous call time up to six hours, and 12 days’ standby time. TalkBand B2 supports devices with Android 4.0 operating system and iPhones with IOS7.0 or above and it will come in three colors, black, silver and gold. The recommended retail price of premium version (with leather strap) is 199 euros and that of standard version (with TPU strap) is 169 euros. Huawei TalkBand N1 is the industry’s first Hi-Fi stereo + Bluetooth headset featuring 4G of local MP3 storage for 1,000 songs, Bluetooth calling, and sports tracking. Made with high quality loudspeaker components, TalkBand N1 gives users the ultimate experience in professional sound quality on par with higher end headsets thanks to chamber tuning. With a 20-20KHz frequency range, TalkBand N1 provides the finest sound quality with higher expressiveness. 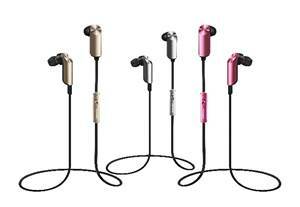 Housing APTX Bluetooth transmission technology, users will enjoy CD quality sound through the Bluetooth headset. Paired with a smartphone, TalkBand N1 is also a health and sports tracker with functionalities include step counting, distance calculation, calorie consumption tracking, and more. It also carries a function that broadcasts the names or phone numbers of incoming calls so users won’t miss a call on the road. With an X type design made with a TPU soft rubber material surface, the TalkBand N1 weighs a consumer friendly 18 grams, and has an IP54 dustproof and waterproof level, making the headset sweat proof for those active users. Additionally, the magnetic earbud design turns the TalkBand N1 from a convenient headset to a fashionable necklace accessory. The TalkBand N1 comes in three stylish colors: Silver, Grey and Red. The recommended retail price of 119 euros.